New AARP report shows fourth straight year of double-digit price average annual increases for widely used brand name drugs. WASHINGTON, Dec. 14, 2016 /PRNewswire-USNewswire/ -- Retail prices for brand name prescription drugs widely used by older Americans rose by an average of 15.5% in 2015—almost 130 times faster than the 0.1% general inflation rate—according to a new AARP Public Policy Institute (PPI) report released today. 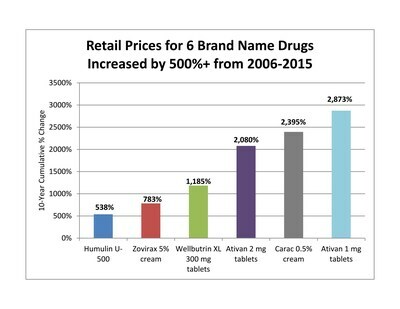 AARP's Rx Price Watch Report: Trends in Retail Prices of Brand Name Prescription Drugs Widely Used by Older Americans, 2006-2015, shows that the average annual cost for one brand name drug used on a chronic basis now exceeds $5,800. For the average older American taking 4.5 prescription drugs per month, this translates into an average annual cost of therapy of $26,000*. This amount exceeds the median income of $24,150 for Medicare beneficiaries. "This new report once again highlights the high and unrelenting price increases that are shockingly common in the pharmaceutical market," said AARP Chief Public Policy Officer Debra Whitman. "What's particularly remarkable is that these incredibly high price increases are still occurring in the face of the intense public and congressional criticism of prescription drug pricing practices." The average annual retail price increase for widely used brand name prescription drugs was more than two and a half times higher in 2015 (15.5%) than in 2006 (5.9%). Brand name drug prices increased almost 130 times faster than general inflation in 2015 (15.5% vs 0.1%). In 2015, the average annual retail cost of one brand name medication used to treat a chronic health condition more than $5,800, compared with nearly $1,800 in 2006. Retail prices increased for 97% of the 268 brand name prescription drugs in the study's market basket. Seven widely used brand name drugs had average annual retail price increases of over 50% in 2015. Five of the six drugs with the highest cumulative price increases over the study period were marketed by Valeant Pharmaceuticals. The retail price of Valeant's anti-anxiety drug, Ativan 1 mg tablets, increased by 2,873% between 2006 and 2015. "Prescription drug therapy is not affordable when its cost exceeds the patient's entire income," said Leigh Purvis, Director of Health Services Research, AARP Public Policy Institute, and co-author of the report. "Even if patients are fortunate enough to have good health care coverage, high prescription drug costs translate into higher out-of-pocket costs—especially for those who pay a percentage of drug costs rather than a fixed copayment—as well as higher premiums, deductibles, and other forms of cost-sharing." AARP's Public Policy Institute, in collaboration with the PRIME Institute at the University of Minnesota, developed a market basket of 268 brand name prescription drug products widely used by older Americans. Using data from the Truven Health MarketScan® Research Databases, the report analyzed retail price changes between 2006 and 2015 for the drug products in the market basket. The medications include products in 49 therapeutic categories used to treat common and often chronic health conditions, including high cholesterol, diabetes, and hypertension. This report is the latest in the AARP Public Policy Institute's Rx Price Watch series. Separate reports analyze price changes for widely used generic and specialty drug products. The series also analyzes the price changes for an overall market basket (i.e., brand name, generic, and specialty drug products combined) to reflect the overall market impact of drug price changes. *These prices reflect the total costs for specific prescriptions and may not reflect the actual out-of-pocket costs (such as a copay) that a consumer would pay at the pharmacy.